A variety of scenarios are important for your development as a PADI Divemaster or PADI Instructor, but also vital for landing that dream job. The greater the variety of experiences under your belt, the greater your offering to potential employers. We operate TWO Downbelow PADI 5 Star IDC Dive Centres, where a wide variety of experiences are available. Our dive centres are the most popular in our area, highly rated, consistently busy and we dive every day. We frequently host groups of sizes ranging from 4 to 30 and, on any given day conduct a generous number of courses from the PADI spectrum be it Snorkeling, Discover Scuba Diving, Open Water Courses, Advanced Open Water Courses, lots of PADI Specialties, NITROX, Tec & Gas Blending, Rescue & EFRs and the full Go PRO continuing education portfolio from OWSI to PADI Staff Instructor. 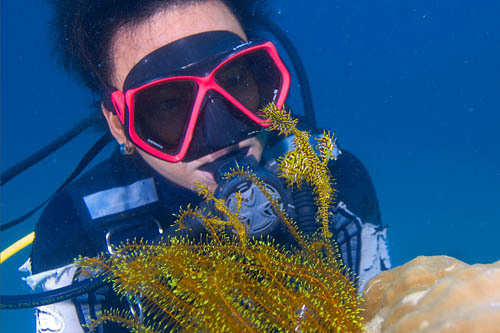 Downbelow offers you the variety of experiences you need for a successful dive internship or professional course to become a well rounded, highly employable PADI professional. Our PADI Instructor Development Course (IDC) is the core of PADI Scuba Instructor training. The IDC develops your PADI Divemaster skills into that of a PADI Open Water Scuba Instructor, who can teach students in a classroom, confined and open water environment. For the best results, we recommend that you join us for a Go PRO Internship, this way you will also benefit from UNLIMITED scuba diving from our island dive center. The added time will open up the world of our busy PADI 5-Star IDC Dive Centres to you, giving you the opportunity to not just learn about being a dive instructor, but also being a dive operator. During your professional program you will gain real world experience, which enhances your instructor development and at the same time enjoy lots of pleasure diving to increase your general diving skill and experience. Conducted alongside our professional scuba diving internships, we have an ongoing local internship program that provides diver training and career development to local people and it benefits both local and international interns through exposure to new languages, cultures and friendships. Our Daily Diving Program consists of 3 Boat Dives a day and we dive inside and offshore of the Tunku Abdul Rahman Park to 49 dive sites accessible to us so there is plenty to choose from. Diving here in the Tunku Abdul Rahman Park and offshore along the west coast is very good, our guests are always very surprised to see such a variety of Marine Life and healthy corals. The park offers some great diving for beginners and experienced divers alike, lots of hard and soft coral, great macro life, schools of tropical fish and many prized critters. 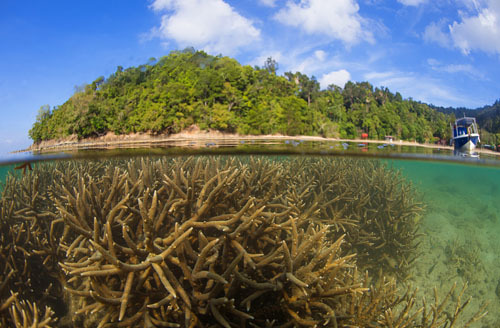 Find out what scuba diving is like is Tunku Abdul Rahman Park. In addition, we are very fortunate to be located in the annual migration path of the Whale Sharks and Manta Rays, which occurs during the months of March and April. We also have a great wreck dive soon to open. The KM Kuraman was sunk by our team in the Tunku Abdul Rahman Park on 17th November 2017. Dive sites within the park are predominantly sloping coral reefs, mangrove areas and sand slopes with plenty of fish life and macro subjects. The TAR Park’s diving sites are ideal for photographers of all levels. Our PADI 5 STAR IDC Centres have a great vibe, they are always busy and lively with guests. With so much knowledge of the diving industry to absorb at Downbelow as soon as you start your internship you will learn quickly the inner workings of a dive operation and utilise this experience for your future scuba diving career. We generally find the hardest part of a GoPro internship with Downbelow, is leaving! Watch Our Scuba Diving TARP Video ! What is the Underwater Visibility in TARP ? Visibility ranges from 4m (at its worse) to 30m (at its best) we generally experience the best “Viz” from late April through to October. During whale shark season the viz is usually at its worse due to the amount of nutrients in the water. If we experience heavy rainfall the river run-offs will also reduce the visibility underwater. But generally we experience 8m – 15m most days. Can My Non-Diving Family or Friends Join Me On The Dive Boat ? Our scuba diving and snorkeling are 2 different programs so each will be conducted at different sites in Tunku Abdul Rahman Park. Sites will be chosen based on their suitability for each program / course by either a qualified PADI Instructor (for Divers) or our professional snorkel guide (for snorkelers). However even though your family / group is booked on the different island activities, all of you will still be together during the activity intervals since we have a lovely beach diving center that we return for refreshment, surface intervals and lunch. It’s a lovely place to rest and and enjoy the tropical surroundings. You will also be together during the land and boat transfers to/from the island. You will only be separated during your course and snorkeling activities. Unless specific requests are made to be on the same boat but this is subject to the dive site and conditions on the day. What if the weather is bad on my activity day - do i get a refund ? It is extremely rare for us to cancel our activities, we average cancelling a day once or twice a year only! We are very fortunate to enjoy year round diving and snorkelling. Only if it is dangerous do we cancel and if you are not able to re-schedule to another day, then we will offer a full refund. If it rains then we have shelter at our Dive Center on Gaya Island, when it does rain it tends to be quick downpours but the majority of the time its beautiful tropical sunshine. Are You Effected By The Monsoon ? We are not effected by the monsoon in the same way as other locations. There are a few geographical reasons for this but the structure of the islands where we are based and the crocker range of mountains mean that we operate all year round with beautiful sunshine most days. Its quite rare to have a full day of rain. Usually when it rains, it does so from about 2pm onwards. It could be a quick downpour or it could last into the evening. We experience the most rain in November & December. January – March is usually very dry. The Benefits of Scuba Diving with Downbelow. We are “Professionals” and we take our role very seriously. We have been “in the business” for two decades. When we go on holiday – we dive – and we treat our clients how we like to be treated. We limit the number of divers on the boat and try to keep people with similar levels of experience on the same boat. Our staff to client ratio is very low, so we can accommodate all levels of divers with their own dive guides. We offer NITROX and dive computer rentals. We are marine enthusiasts so you also get to learn about what you see. We take care of your equipment so you do not need to carry heavy tanks or bags of gear around. Its all set up and washed for you, unless you are completing a course where you must learn the skills yourself as part of the course requirement. All our PADI Instructors are taught in-house by our resident Platinum PADI Course Director resulting in a very high level of experience within the team. Safety is paramount, we adhere to PADI standards and procedures and follow British HSE guidelines. 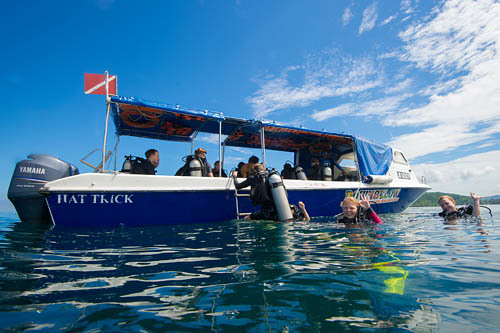 The park provides an ideal location for conducting PADI dive courses. Many people choose to complete PADI Open Water Diver, PADI Advanced Open Water Diver or Refresher (PADI Re-Activate) courses with us before continue their journey to Kapalai, Sipadan or dive sites elsewhere. A great variety of dives sites can be found just minutes from our island dive center. That way even student divers still get to dive some of the most beautiful dive sites. Please view our TARP Photo Gallery to see more images of the fascinating underwater marine life of TAR Park. All images were photographed in TARP by Richard Swann, Downbelow’s Managing Director & PADI Platinum Course Director. Read Richard & Joanne Swann’s article: Destination TARP in Sport Diving Australia! !